AD Architectural Digest, Le Più Belle Case Del Mondo, Andrew Martin Interior Design Review UK, Casa Viva Greece, Case & Stili Italy, Chicago Tribune USA, Global Trendy House, 全球新潮住宅盛典华中科技大学出版 China, Haw Nom Bulgary, House & Garden UK, House & Garden South Africa South africa, Interior Digest Russia, Interior Public Space Collection , 室内公共空间 China, Kurier Wien Austria, Marie Claire Maison Italy, Plaisir De La Maison France, Pure Premium Park Germany, Space China, Sustainable Residential Interiors, J.Wiley & Sons USA, Tell Magazine Switzerland, Ville & Casali Italy, Le Paradox France, Aesthetics of Life China, Sustainable Residential Interiors USA, Global Trendy House Collection. 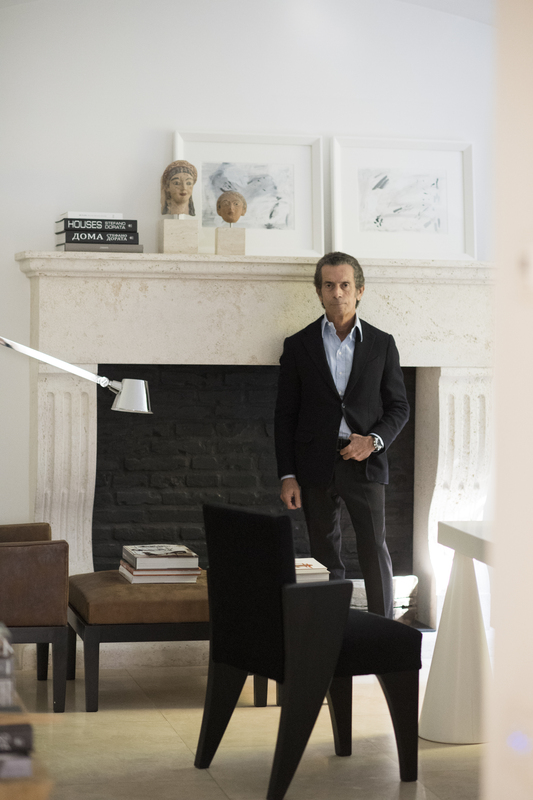 Dorata’s projects and interventions with furnishings he himself designed are the theme of two books published previously by Gangemi Editore: Interni Romani and Architetture d’Interni: Immagini, Emozioni. On the occasion of the presentation of his second book, a photographic exhibition featuring some of his works was held at the Museo del Complesso del Vittoriano in Rome. The Maxxi National Museum of Arts held his third book presentation, Case By Stefano Dorata, in 2014. This is what he has to say about his work: ‘When designing my projects, I tend to link the architectural element, composition, functionality and technology to a common denominator based on harmony. The words of my architectural vocabulary are: emotion, perspective, balance of proportions, symmetry — with its occasional infringements — balance and, at times, disruption of light and shade. I seek classicism in contemporary values and invention’ Simplicity and order are the psychological and aesthetic features that Stefano Dorata seeks in architecture and when he is designing his projects. His journey is a long-standing one of research during which his creative language has been refined and enriched and become more precise in the sense that it has abandoned eclecticism in favour of careful blending of styles, but all without ever repudiating the principles of classicism and the elements constituting it. When looking at his houses – from those in cities and by the sea to those in the countryside and mountains – one becomes aware, on the one hand, that the use of the golden section, symmetry, axiality and perspective from a syntactic schema intended to convey the sense of balance that is so essential for those living in today’s homes. On the other hand, they become the basis for a dynamic dialogue between interior and exterior, which, in its turn, becomes a sort of room where it is possible to commit infringements and upset logic in order to cause surprise, interrupt order at particular points and create emotional foci: a perspective misalignment, a difference in level, clashing colours or an unexpected change in the disposition of the furnishing – these are small touches having a notable effect. Thus there is nothing routine about Dorata’s projects, but rather a emotion common to them that is expressed with masterly skill according to the location of the house and those living in it: it is simpler and more natural by the sea, more exuberant in the countryside, more romantic in the mountains and more classical – in a modern sense – in urban settings. Never the result of rational calculations, these extra qualities are always slightly different, revealing intuition and impulse and also a vision shared with the client deriving from continuous reflection on past experiences and feelings, and solutions adopted previously. So every time Dorata tackles a new project, he effectively takes a step forward.